We are John and Thea Verhoeckx. 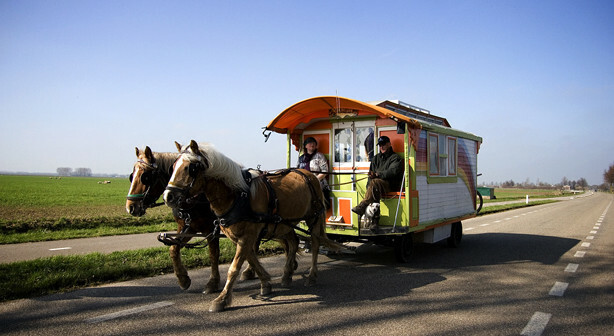 A Dutch couple travelling in a, Horse-Drawn, Caravan We make a journey from the North Sea until far in the East. 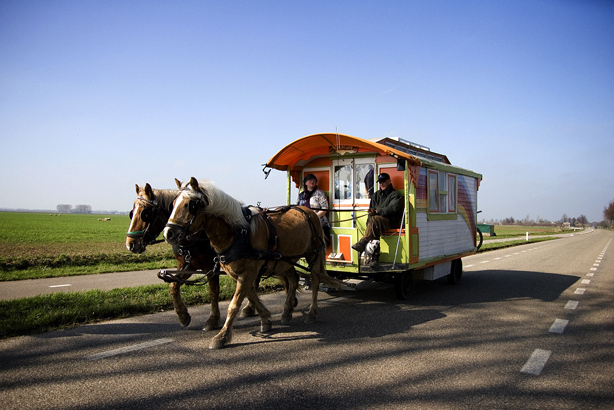 With two horses, two people a dog and an hors-drawn carriage wagon. No goal to reach, just a direction to take. With challenges, joyfully encounters and never to now where to sleep that day! We also arrives on camping places. Immediately surrounded by children and their parents! Today was a very hot day. Aysha the oldest horse is tired en we decide to stop early. We are more and more familiar “to claim” spots along the River Main. We still ask people if they know who the grassland belongs to, most of the time it’s from the local authorities and we know it’s all right. In this sense we’re become more and more like gypsies. Although, this day we arrive on a spot where lots of caravans, trailers and Mercedes Mobil homes were already parked. They belong to the modern type of gypsies that travel throughout Germany. When we arrive with our “horse beauties” we do not have to complain about interest. All kinds of past stories are told. Before we even got the horses on the grassland somebody came to us with baked fish and a salad. Later on in the evening they bring fresh fish and I’m, for the first time in my life, cleaning the insides of a fish. The family next to us has three kids, two bigger boys and a girl from around 12. 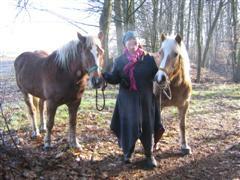 The horses are very appealing to them because they know they used to own some horses themselves. Richard, the eldest, is telling us with a sparkle in his eyes and big gestures, that his horse was called Ramses, because it was a proud horse and it needed a big name. I promise them, the can ride the horses if they want to. The girl is very enthusiastic and later she returns to tell us that Richard want to ride as well. When the moment there, the girl is really enjoying the ride but Richard thinks it’s a bit weird. He doesn’t want to anymore, that’s what he says, but his face is telling me something else. I give him a choice: mount from the left or from the right and within two seconds he’s on top of Aysha and rides two full laps around the grassland with a grin from one ear to the other. The next day “uncle” arrives, an older gypsy with a big moustache. Telling about stealing in the past and that it does not happen nowadays . They don’t “claw” anymore and with a smile he makes the well-known gesture of stealing. When we leave we are send off by at least 10 gypsies wishing us the best. We are traveling from Tilburg to Haghorst. A big camping place full of horse drawn caravans. A wonderful place to stay. A bit cold and lots of snow. Typically Dutch! Unfortunately, their blog ‘Slow Express Pony’ has disappeared and no trace seems to exist of this wonderful couple.